Some people apparently enjoy reading my blog. They visit my site, read all the stuff that I write regularly - re: become my blog's loyal followers and (some of them) even nominated me for blog awards. Just so you know, I am truly honoured and privileged to receive each of the award. This said, to all of you who have appreciated my blog by nominating me for these awards below - thank you very much! 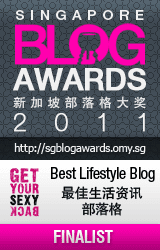 (1) Finalist of Singapore Blog Awards 2011 under Best Lifestyle Blog Category, organized by omy.sg, a bilingual news and interactive web portal by leading media group Singapore Press Holdings Ltd (SPH). (2) The Liebster Blog Award from fellow bloggers, Dana of Jane and Lorraine, Ellie of The Boo, The Bear and the Goji Berries and Michelle of Cherry Become Cherry. (3) The Versatile Blogger Award from fellow blogger, Gabriela of Our Earth Land. 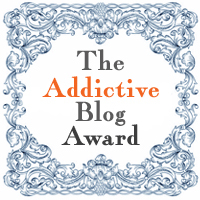 (4) The Addictive Blog Award from fellow blogger, Emma of Food, Fork and Good. Thank you all, for taking the time in reading my blog.